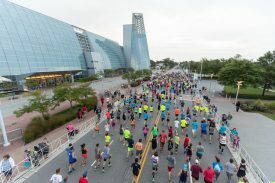 VIRGINIA BEACH, VA – The Rock ‘n’ Roll Virginia Beach Half Marathon announced a new start line for the Saturday 5K and Sunday half marathon held as part of the area’s premier running festival. For the seventeenth year, thousands of runners are expected to hit the streets of Virginia Beach September 1-3 for the Labor Day weekend event featuring the Health & Fitness Expo, two days of running, high energy music on the course, and a post race concert. To prepare for the big weekend, race organizers are holding a Mock Run on Saturday, August 5 at 7:30 a.m. This is a chance for runners to get a sneak peek at the new course start. Those interested can join in the 10-mile fun run on the sidewalk at 14th Street and Pacific Avenue. This event marks the one month countdown to the running festival weekend. The event is free and open to the public and includes giveaways, a water station and place to meet up for an optional brunch after the training run. Race weekend will kick off Friday, September 1 with a two-day Health & Fitness Expo at the Virginia Beach Convention Center. The expo is free and open to the public and features more than 100 exhibitors offering free nutritional samples and showcasing the latest in running gear and fitness apparel. New this year, the 5K race will take place on Saturday, September 2 at 21st Street and Atlantic Avenue prior to the one-mile beach run on the sand. Those looking for even more of a challenge can run the 5K Saturday morning at 7:00am and the Mile on the Sand at 8:30am to earn a bonus Land to Sand Challenge pin. Sunday’s events include the half marathon and post race concert featuring Sister Hazel. Also new this year, the start line for Sunday’s half marathon is now at 14th Street and Pacific Avenue. Runners will start adjacent to Atlantic Fun Park on Pacific between 14th and 15th Streets, then head up Pacific, making their first turn at the iconic King Neptune statue. “With the start and finish lines within walking distance, it will be very convenient for runners to coordinate with friends and family as well as for spectators to catch a glimpse of the beginning and end of the race,” said Mak. Rock band, Sister Hazel will headline the 2017 Rock ‘n’ Roll Virginia Beach Half Marathon on Sunday morning immediately following the race. The post race concert, in partnership with the American Music Festival (AMF), will be held on the beach at the 17th Street finish line and is free and open to the public. Rock ‘n’ Roll Virginia Beach Half Marathon takes place in conjunction with the AMF, which will celebrate its 24th year in 2017. Half marathon runners will have access to three major headline bands performing on the 5th Street main stage and other stages along the boardwalk. This year’s headliners include Rebelution, Michael Franti & Spearhead, 3 Doors Down and The Wallflowers. Tickets for family and friends as well as passport pins, preferred viewing passes, and VIP passes are available through all Ticketmaster outlets, including online www.ticketmaster.com or by phone at 800.745.3000. The 2017 Rock ‘n’ Roll Virginia Beach Half Marathon, 5K and Mile on the Sand will take place the weekend of Friday, September 1 through Sunday, September 3. The half-marathon will give runners a first-class tour of Virginia Beach starting at 14th Street and Pacific and finishing at the Virginia Beach Boardwalk. Runners can rock to the sounds of live, local bands along with enthusiastic cheerleaders to keep participants moving. The event concludes with a finish line festival and daytime concert with Sister Hazel in partnership with the American Music Festival. A two-day Health & Fitness Expo kicks off race weekend at the Virginia Beach Convention Center on Friday, September 1 and Saturday, September 2. The Expo will have numerous vendors featuring the latest in running gear, nutrition and training tips. To register for the race or for more information visit runrocknroll.com/virginia-beach or follow us on Twitter @RunRocknRoll.